Jan came to stay with us while she underwent the Picozzi Protocol – an intensive chemo / radiation treatment plan that is meant to be done every day over the course of six weeks. She arrived on the 10th of November for her first treatment on the 11th, Jan was ready to get this done and over with by December 18. 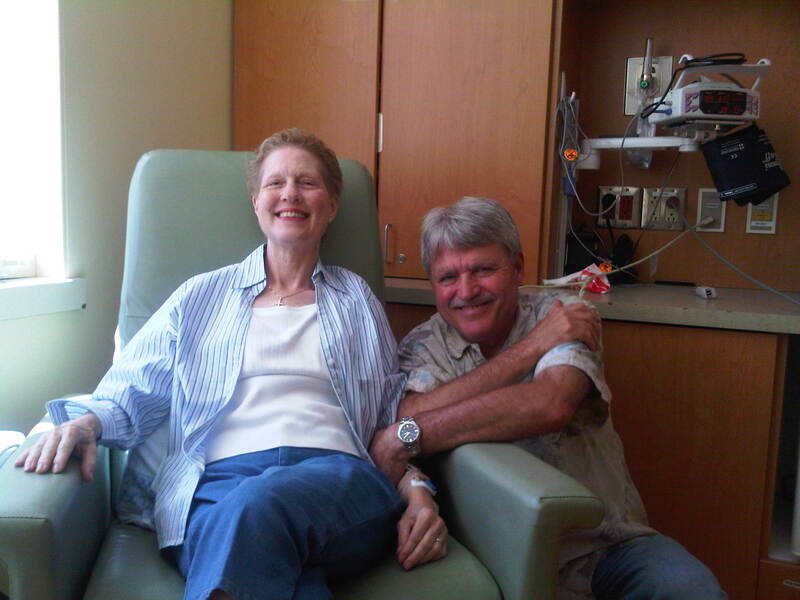 I had lined up family and friends to help with driving her to and from Kirkland to her treatment sessions every day. I did it about 2-3 times a week, but as I was working full time throughout, I couldn’t always be there. I was home with her a lot and we had some very meaningful moments throughout. Mom and dad were upset they couldn’t be more help, but dad was in the thick of his own chemo treatments and they responded the best way they could – by sending money. With that money, I hired Lucian to drive Jan as often as was feasible, and they forged a wonderful bond of friendship. Even in her worst moments, Jan’s ability to shine through with her positive light never wavered. She took this challenge on with grace, dignity and a will of iron. She was going to make this work for her! I kept a journal while she was here and there was more in it than I remembered. This may be harder than I thought. The logistics weren’t easy to manage, but I now have a plan to follow with dates and times lined up in order, and people assigned like soldiers. Driving in and out of the city was OK this morning – maybe because it was Veteran’s Day – Maybe because it was sunny – who knows, it just wasn’t as bad as I thought it would be. But watching my sister suffer the side effects and feeling powerless to help – that’s not easy. She is a beautiful soul and knowing that she hurts is hard. It breaks my heart. I want her well. I rubbed her back, hoping to magically transfer strength and wellness to her, wanting the warmth of my hands to spread to her aching muscles, knowing I had no magic, but wanting some, all the same. I love my sister. I want her well. On the surface, things seem to be going well. I’m happy that Jan is comfortable, the arrangements for her transportation are working and she is bearing up. My dreams are telling me something else. I’ve had some very vivid dreams that linger. One, a few days ago, was my dad telling me I needed to get up and be productive – I was at their house and it was already 11 a.m. I felt terrible that I’d let him down. Another was last night – we were at a Subway Restaurant and we owned it. There was one employee there and she was telling us how they did things. I looked up and saw a line of customers that went out the door. I realized that even though I didn’t know what I was doing, I’d have to help. I guess at a gut level, I feel like I may let people down and that I’m doing something I don’t feel I know how to do , but I suppose that’s normal. I continue to plan to take each day as it comes and hope for the best. Jan is home for the weekend and I hope she rests, recharges and feels well. She’s in good hands with George. Penelope will miss her, though. Well, two days down from this week’s endurance test – for both Jan and me. She, more so than me – the procedures really take it out of her and she is tired a lot, not able to eat much. She seems OK when she’s awake, but is moving so slowly. She has a state of calm about her that reminds me of a Zen monk. Calm, quiet, and serene – with a bald head, too. I’m on my own this week and that adds to the logistical challenges. Once we get through tomorrow, the week gets better. I think we’ll make it – at least, I hope so! Adrian insists on taking the bus tomorrow, which makes me a little nervous, but I know he’ll be OK. I’ll just be glad when we are all home and safe. Jannie went home today for a week. Her white cell count was too low and they don’t want to give her any more chemo or radiation until she’s feeling stronger. I’m actually relieved – she’s seemed so weary and I’m hoping that they will be able to adjust things to be sure they aren’t overtaxing her. So she gets a week to rest up, feel better and then she’s back on Wednesday, just in time for Thanksgiving. The break extends her treatment in to Christmas week, which nobody wanted, but we’ll deal with that when the time comes. For now, she’s home and happy to be there. I know that there’s no other place she’d rather be. I’ll miss her – I’ve gotten used to having her nearby. Thanksgiving week – time to start the holiday cooking, planning, baking. Thanksgiving dinner is one of the easiest meals to cook – it just takes time, not a lot of finesse. Jan will be with us this year – George will be in Portland, and Graham will be in Tucson with mom and dad. I’m sure they would much rather all be together, but this is how it worked out. I’m looking forward to having everyone home for a few days. It will be a little crazy, but I don’t mind. One thing I’ve been thinking about is how much providing food and cooking for others equates to love for me. Making a meal that everyone enjoys is a great feeling. Cooking for Jan has been a pleasure – trying to help her by giving her something that tastes good – it’s almost like a ministry through food for me. I’m feeding more than her body – I’m trying to care for all of her the best way I know how. This Sunday, a face I recognized looked out from the obituary page. A woman I went to high school with had died. She died of pancreatic cancer after about a year’s battle. She was in Dr. Picozzi’s study, too. It hit me hard and I felt her loss deeply – and felt as though I wish I’d known. I thought maybe I could have been a comfort to her – since I was at Virginia Mason so often, surely our paths would have crossed. Then I wondered if I should tell Jan – it felt like it was too close to home. I did tell her today when I was picking her up at Virginia Mason. She said,’ no, not Linda’ – she had been her buddy in the study. She had talked to her about the treatments and how to manage the side effects. Jan didn’t know she’d died – and had just left her another message today to check in on her. How sad that we were both connected to her and didn’t know it. How wonderful that Jan was there for her in her time of need. Jan didn’t realize that she’d been a Ballard High School alum, and thought it was even more special that they had been put together. Jan reacted to the interferon again today. It really hit her quickly this time. We barely got her home to get her in bed. She didn’t get a chance to eat anything, which makes me worry. I hope she rests well through the night. I will feed her well tomorrow and let her rest and relax all she needs. In spite of it all, she looked good to me today and I hope she continues to feel better. These shots are a real pain – it’s not fun to see her so uncomfortable. Man, I just want her well. I wish I could take the shot for her. It’s just too hard to see. It’s like watching her get hit when she’s down. It’s been awhile. Jan went home after Thanksgiving and when she came back on the next Monday, she was only able to get 2 more treatments then had to skip a week again due to low white cell counts. She then had to skip another week because of a tooth abscess. That meant she didn’t come back up until the 16th of December. She was supposed to be done on the 18th, but now it looks like she may be doing this through mid-January. She was here on Wednesday and as before, she ended up getting home and heading straight to bed due to the reaction to the interferon. She was pretty miserable again, but managed to make it OK. She was in bed pretty much the whole time she was here again. She went home yesterday and is feeling better. Dr. Picozzi lowered her chemo dose to help her tolerate it better. We’ll see if she can make it past Wednesday this time. Next week is Christmas and we leave for Tucson on Thursday. It’s going to be sort of overwhelming to go from caring for Jan to Dad. He’s been struggling with his treatment this past few weeks as well and is feeling pretty rotten. My fear is that I am going to feel like I am never away from it and I need a break. Then I feel guilty for feeling that way because I only have to help – I’m not the one fighting for my life. Layer on top of that the stress of having Seth! and Lucian out of town in January for most of the month having to balance a super busy week at work with being a single mom while helping Jan, and I think that I will probably just want to give up by the 3rd week. Thinking through this before, I thought the hardest part would be over by now, but it’s really only just beginning. I wish I could blink my eyes and have it all be done. But I love these people and this is what they need. I will make it. This entry was posted in Cancer, Family, General Rambling and tagged chemo treatments, radiation treatment. Bookmark the permalink.